My academic role includes the design and delivery of modules in Education Studies around the use of technology in teaching and learning. I led on the design of a series of modules listed in the JISC Exemplar Case Studies for Higher Education with a focus on TEL and student engagement. 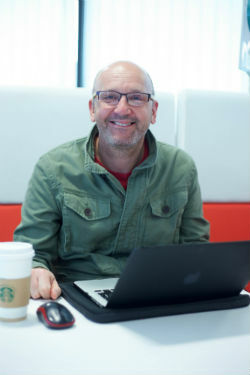 My research interests include Deleuzo-Guattarian approaches to education, Popular Education, Critical Theory, technology and community engagement, Action Research and online/ blended learning. Developing student focused activities and experiential approaches to academic work inform my pedagogy with a particular focus on emergent learning theories. I teach research modules and supervise dissertations at Level 5 and 6 on the Education Studies programme and on the Coaching & Mentoring degree at UCBC. My current research includes the development of the Community Open Online Courses (COOCs) platform that explores the ways web based technologies can shape new approaches to learning in, and beyond, institutions. I have previous experience in management and lectureships in Adult Literacy and Teacher Training. Action Research in to the use of open and online technology in the creation of a community-based learning and teaching platform (PhD thesis, ongoing). Community Based learning Project, LSIS funded (£25000; December 2011 – July 2012). HEFCE Catalyst Fund, Project Lead. Interactive Essays: A Research Project into the development of digital creativity and networking within academic assignment writing. December 2016 - April 2017. Level 6: Dissertation (Education Studies); Dissertation (Coaching & Mentoring); TEL Project (Level 6); Research Supervision. Shukie, P. (June, 2012) Literacy in Online Space. JISC Summer Conference, Presentation (link). Shukie, P. (2014). ‘A study of popular education approaches to learning in open and online courses’. OER14 Open Education Conference, Newcastle University, April 2014. (link). Shukie, P. (2015). ‘I’ll let you be in my Dream if I can be in Yours’ FE News, December 2015 (link). Shukie, P. (2017). Courage and Risk: The real learning for the researcher. Higher Education Ashton Review. Available from https://issuu.com/jfletchersaxon/docs/hear_magazine_2017_online_layout_pd. Shukie, P. (2017). Seeking Emancipation in a World of Online Emancipators. In M. Daley, K. Orr, & J. Petrie, The Principal: Power and Professionalism in Further Education. London: Trentham Books. Shukie, P. (November 2017). A poetic, rhythmic approach to a textual representation of emancipatory learning in online spaces. Power and Professionalism in FE Conference, ARPCE, University of Huddersfield (Saturday 25th November, 2017). Shukie, P. (2017). Action Research – The art of becoming educator through finding yourself. The Power of Research, Participation and Publication Conference, University Centre Blackburn College (Thursday 30th November, 2017).